Okay, so we are well aware that scarecrows are supposed to be scary. However, from time to time a few silly ones get thrown into the mix and there is absolutely nothing wrong with that! 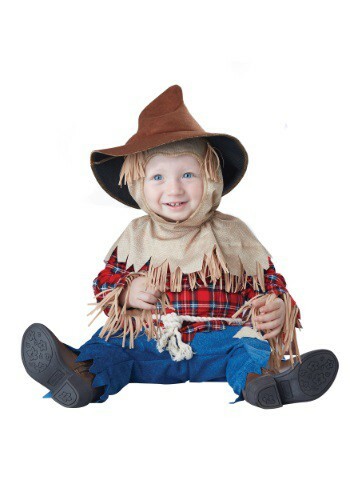 Sometimes it’s better to win the crows over instead of scaring them off and with this Silly Scarecrow costume, your kiddo will be able to charm anyone with his goofy antics. Your little scarecrow will be full of giggles and smiles. He’ll be such a happy little guy that even the crows wouldn’t dream of doing anything to any field he’s working. Dress up your little harvest cutie in this Silly Scarecrow Costume for Halloween this year or on any beautiful autumn day you feel like having a photo shoot by a stack of hay or a pile of pumpkins. This costume will set your child up with everything he or she will need to transform into the silliest scarecrow anyone has ever seen. A plaid shirt with an attached rope belt and a pair of pants with patches starts the transformation but it is complete with the hood and hat. The hood has a wide collar with jagged edges to give the costume a more worn look and the adorable cone hat is stuffed with foam so it will always look picture perfect! If you want you can even grab one of our scarecrow straw kits to give your little one a more authentic look. Dress your little one up with this Silly Scarecrow Costume and have the goofiest kiddo skipping around the block this Halloween. Just be sure you keep a tight grip on your cutie, straw is just so very light and a big enough gust of wind could send him flying with the crows!